Contact the "Valley of the Sun S-Gaugers"
"Box Car Auctions of the South West"
"My Classic American Flyer Table-Top Train Layout"
Published by Chuck Eral, "Valley of the Sun S-Gaugers" member. My First DC Can-Motor Conversion on A. F. 4-4-2 #300 Steam Engine. Customer Service (Doug) is the best! You will receive two pages of information on installing (converting) American Flyer Trains to DC from AC or doing what I did, using the DC Can-Motor with the Dallee #400 Reverse Unit to run the conversion on AC . This was a very simple installation replacing the original Gilbert American Flyer steam engine motor with a strong, reliable can motor, which can be either used in a AC or DC operation. "Scale speed" version comes in either AC or DC. This will operate your engine at about 50% of the normal speed, but get full voltage for headlight, smoke-unit, and reverse unit operation. They don't recommend this conversion for the 4-8-4 Northern. First install the Dallee # 400 4 amp electronic reverse-unit in the tender, on top of the weight with the mounting tape provided (following instructions provided with unit). 1. Make all the following connections before attaching the six-pin plug supplied for the reverse-unit in order to eliminate any potential heat damage to components. 2. Connect the Blue wire to the truck rivet that has the metal wheels on the right side of the engine when facing forward. 3. Connect the Black wire to the other truck rivet. 4. Connect the Red and Brown wires to the the two terminals on the Can-Motor. 5. Connect the Yellow and Orange wires to each other and insulate by putting (heat) shrink tube over the very ends of the two wires as in the photo below. 6. 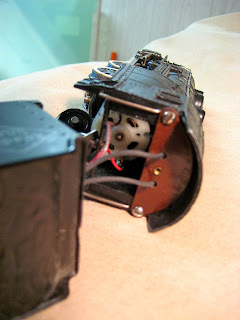 The head light wire ( and smoke unit if present) should be wired directly to the two track rivet connections. Do not connect these wires to the can-motor. 7. The Dallee reverse unit is designed for easy installation of accessory items such as lighting. Many lighting variations are possible and easy to incorporate because of the design. You can see in the picture (2) that I ran the two Black head light wires through the jack panel to give the conversion a cleaner look. All four wires from the engine were wired through the rubber grommet in the tender body assembly. I was very pleased with the performance of the Port Lines Can-Motor. The American Flyer 4-4-2 #300 ran at a "snail pace" with ZW Transformer set a 6 volts. The Dallee Reverse Unit didn't miss a beat at any speed or location on my layout. I'm looking forward to my next conversion. I just did my second conversion on the 293 4-6-2 NYNH&H with the 1/2 speed can motor from Port Lines Hobby. My first was a full speed can on a 300 4-4-2 Atlantic. Both conversions I used the 400 Dallee reverse units. I can tell you comparing the full speed to the half speed can motors. You get a lot more smoke with the half speed can motor, because at half speed your putting out just as much smoke as you would be going at full speed. But I might get more smoke because I'm going with the Dallee reverse unit and followed their directions on wiring the smoke and light directly back to the tender not to the E-Unit or motor. I have my lay out in the garage. The smoke was so thick I had to open the garage door and turn on the big floor fan. But you can do that in Arizona this time of year....My wife came out it the garage and ask what I was smoking? Just a little cho-choo! I will get some photos up and maybe a video comparing the two conversions running side by side. Note: I did find one thing that was interesting. I always bench test everything before putting it back together. When mounting the can motor I found you have to tweak the clearance between the mounting plate and the engine motor mount. When tightening (hand tight) the allen screws my rpm on the motor drop off quite a bit. I found out by backing off, all most a full turn on the allen screws the can motor ran at its highest rpm. I just went ahead and made a gasket for that clearance for the mounting plate and hand tight down the allen screws on the can motor. The can motor ran just perfect after that tweak! The 293 NYNH&H 4-6-2 American Flyer with 1/2 Speed Can-Motor Conversion Video in HD for you to enjoy! CTT Forum - American Flyer 1/2 Speed Can Motors This is a cutaway of the American Flyer chassis with wheels removed to expose the worm gear meshing with the drive of the 1/2 speed can-motor. This was bench tested with a Dallee 400 electronic e-unit in slow speed to full speed, forward and reverse. locations where the groove begins. worm gear (on the axle) at half the speed. Both worms mesh perfectly with the worm gear. S-Gaugers Contact Information: Come join us in the "The Wonderful World of Model Trains"